This looks like a really fun block to put together. I really like all of your green choices. Cool version. It's like ombre effect. Good luck with the quilting part! Love your take on this pattern. What a great design! Love the greens. Can't wait to hear about your experiences with those rulers. Have fun! The quilter rulers had even more possibilities. Neat! 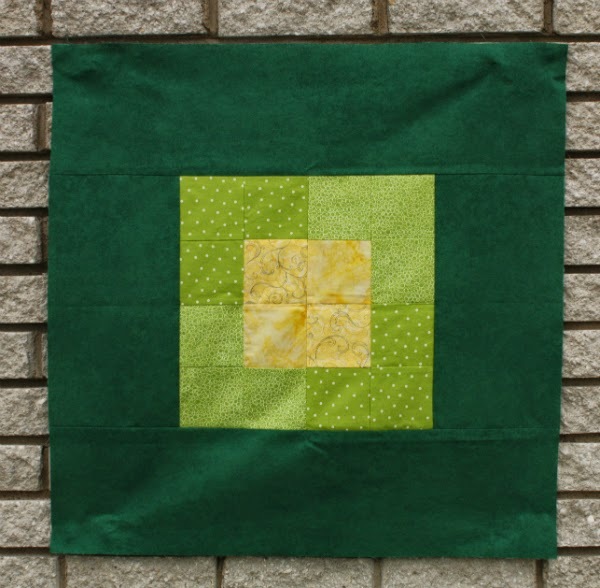 I like your square, good choice on contrast, spring time colors and pattern. It is fun and time consuming to pick the fabrics. I find that it feels especially so because there are so few of them. Your choices are lovely and I hope you will show it off when it is all done. I need those rulers too, they look great.